Personally, I blame the Ukulele Orchestra of Great Britain, UOGB. After seeing them, my wife made the mistake of buying me a soprano uke. I enjoyed learning what it could do but found the size a tad small. So I bought a concert sized Vox solid, (better but still too small and now used as what I call my ‘travel’ uke), and finally, a Kala tenor, (perfect). However, what I was searching for was a uke that just didn’t just go ‘doink’ as Will Grove-White described it in his book ‘Get Plucky with the Ukulele’ (a great book by the way and also very funny). I wanted something that would extend the uke’s voice. I also wanted it to be made of something other than wood. There’s a reason for this. As we’re all aware, wooden ukes can be affected by a whole host of things such as humidity, temperature and so on. In my work I used to travel quite a bit so wanted something that didn’t have this issue. Hence my interest in carbon fibre. 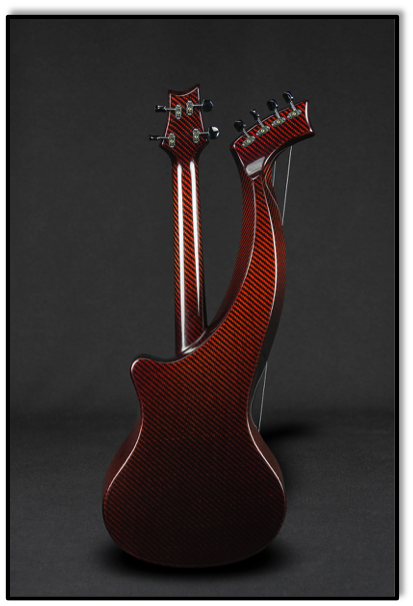 I’d also begun looking at harp guitars, (as you do), and that’s when I came across Emerald Guitars and their Synergy harp guitar. 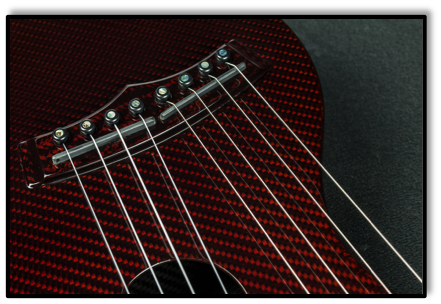 The design ticked all the boxes for me; it wouldn’t just go doink; it would extend the voice of the uke in areas that could be quite exciting to explore; it was carbon fibre; and finally, to be honest, it looks fantastic. 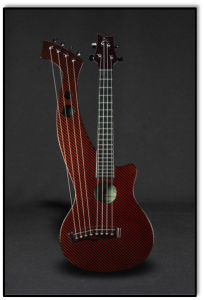 I thought, wouldn’t it be a great idea if you could have the same form but as a harp uke? I touched base with Alistair and we discussed a few things. Long story short, in February, 2015, I went over to Ireland with my wife to collect it. To put it mildly, I’m delighted. First, I consider myself an ‘enthusiastic beginner’, so keep that in mind when you listen to the sound files. Anyone mocking my (rubbish) playing will be seen to. You have been warned! As I’ve said, I didn’t want a uke that just went doink, I wanted some sustain along with a warm tone and resonance. The advantage of having bass strings is that they help create the resonance you tend to not experience with the standard uke. Additionally, the Synergy harp uke extends the voice of the instrument which is what I wanted in the first place. Like some others who have experimented with this form, you find yourself trying out different styles. I’ve also become quite interested in campanella and other finger picking styles which suits this instrument very well. I’ve attached two files of me playing scales for you to hear what I’m talking about regarding the tone. The tuning for the sub bass strings is GDFG. I’ve been playing around with this and tried out, quite successfully, GDEG. It’s a personal choice and you can experiment. It also means that I can also play some of the low G stuff required with a number of tunes. When you play the sub bass tuning sound file just listen to the sustain. Sweet. As for where the instrument takes you, well, I started playing some stuff from one of Rob MacKillop’s uke books, (another excellent learning resource by the way,) and it morphed into something quite different. It’s about 1’ 30” but gives you an idea of what you can do with just a couple of chords. If a beginner like me can go in directions like this, you can only imagine what a really competent player could do. Not only that, but you can use it in the same way as you do with a normal uke, i.e. strumming and sing-along and so on. In sum, it’s highly versatile. Strings: Always a matter of preference. 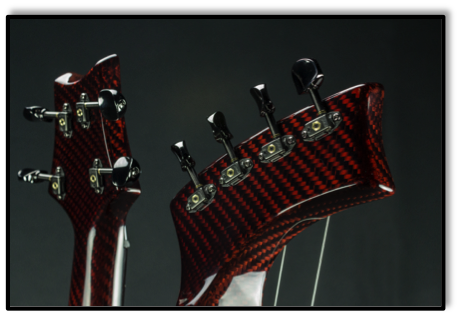 On the neck they’re Aquila Nylgut and for the sub bass strings, the E string is from a classical set (Daddario Pro Arte EJ45, normal tension). The other three are the B string from these sets. 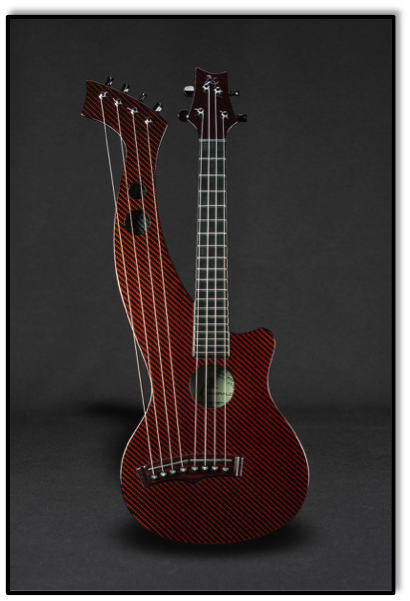 To summarise, Emerald’s Synergy harp ukulele allows you to play the instrument like a conventional uke. The additional strings also mean that you can go in directions not normally available to a regular uke. Finally, you have the benefit of sub bass strings which add a significant richness of tone and sustain. Experimentation and fun with something that looks as gorgeous as this – that’s a nice mix. Seriously. Oh my God! It’s stunning, beautiful and amazing and I must definitely have one, immediately if not sooner! It really is, TonyD. And I’m having fun with the instrument. It just takes you into areas that you hadn’t considered before as I indicated in the review. If you did go ahead with a purchase it would mean that we could start sharing ideas etc., one of the main things that I like about the uke community. Speaking as a poor student, I’m guessing if you need to enquire about the price you probably can’t afford one. I’m surprised by how good carbon fibre sounds too, the sustain is lovely. MAt, a fair point re. the price, but I think it’s worth saving up for, (it’s such a flexible form.) Re. the sustain, we’re in complete agreement there, I can’t believe how good it sounds. Appreciate the comment, thanks, man. Urbanmeister…I’m so JAZZED that I already have mine on order. I hope that I can sound as good as your “Tune Excercise” in short order. I can see this instrument taking me to places I’ve never been with an ukulele or a guitar. I’m so glad that Alistair finally is putting out an ukulele version of CF. I’ll bet it’s not his last either, as he too will be bitten by the ukulele bug. Thank you for sharing this information, much appreciated. Gorgeous. All, I really appreciate the comments. Thank you. 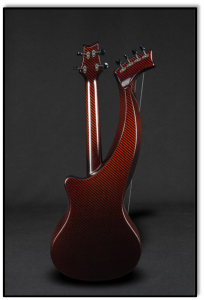 Just to let you know there’ll be some news on Emerald Guitars website in the not too distant future about the harp-uke being available to order. Y’know, I’m still finding this instrument a delight to play. The more I do so, the more I find it just going in so many different directions. For example, I hadn’t thought of tuning the bass strings so that I could use it on some of the classical, Bach etc., kind of music I’m also trying to learn. As I’ve said, it’s just such a joy to play. Finally, we ought to remember that it’s this site and Woodshed’s work that enables us to share our thoughts and enjoyment of this fantastic little instrument. Thanks, Woodshed, and I know that I speak for many. Urbanmeister: Thanks so much! I really appreciate it. Glad you’re still enjoying your uke!